What are your options for DISH 4K? 4K is coming… it’s just a question of when. I think everyone’s a little annoyed that there aren’t more live 4K channels, but there just… aren’t. DIRECTV leads the way with three live 4K channels, but they produce all of them in house. Not only are there no 4K channels from other providers like HBO or Discovery, no one has even announced one yet. So it’s going to be a while. What can you do if you have DISH and you want to have a look at the best 4K programming out there? Once you have it all hooked up… what’s there to watch? Well, not a lot. 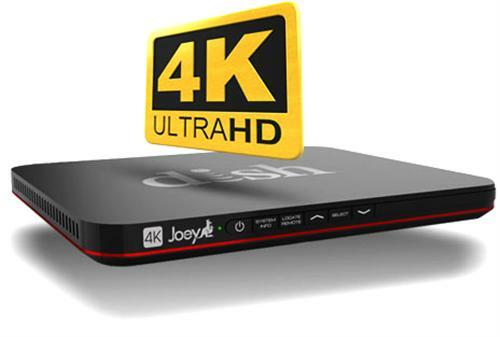 There are some 4K on demand programs available, mostly pay-per-view movies. These are delivered via internet so you’ll want to record them to the Hopper instead of trying to watch them live. DISH had some Olympics content in 4K over the summer but they don’t have any live 4K right now, as I write this. For live 4K programming, you’ll want to use Netflix, but luckily for you, Hopper 3 has a Netflix client built-in. You won’t need a separate streaming box. If you can sustain 25Mbps downloads, you’ll get the best Netflix can offer in 4K, on all the 4K Joeys and the Hopper 3. I’ve said before that Netflix 4K isn’t really much better than HD, and that’s true. I guess some 4K is better than no 4K at all. Hopper 3 does not support HDR, so you won’t get the highest quality programming from Netflix. It’s no fun to say, but at this point you probably don’t want to think about a 4K upgrade from DISH unless you really dig Netflix 4K and you want to be futureproof. It’s hard to know when we’ll start seeing any more 4K channels. When they do come, they’re expected to be delivered using DISH’s current satellite fleet, at least until there are so many of them that they need another satellite.